Ramon Dominguez is a Venezuelan jockey who has an estimated net worth of $40 million. Though he already retired, he is best known as the Eclipse Award-winning champion jockey in the American Thoroughbred horse racing. Ramon A. Dominguez was born on November 24, 1976 in Caracas, Venezuela. He began riding horses at the age of sixteen in show jumping in Venezuela. He later turned to riding thoroughbreds in flat racing events at La Rinconada racetrack. In 1996, Mr. Dominguez immigrated to the United States and started riding at the Hialeah Park Race Track in Florida. In 2001, he got his first real break when he became the jockey with the most number of wins in the United States. He made a repeat in 2003 and 2004 when he won the Isaac Murphy Award for having the highest winning percentage among all American-based jockeys. Ramon Dominguez is the regular rider of two-time Eclipse Award-winning turf champion Gio Ponti, a prize horse that he has ridden to victories in six Grade One stakes races such as the Belmont Park’s Mon o’ War Stakes twice, and the Manhattan Handicap, Arlington Million, Frank E. Kilroe Mile Handicap. In 2004, Dominguez got his first win at the Breeder’s Cup when he rode Better Talk Now to victory in the Breeder’s Cup Turf. In one day, he has won six races on two different occasions which tied the “same day win record by a jockey” among all NYRA tracks. 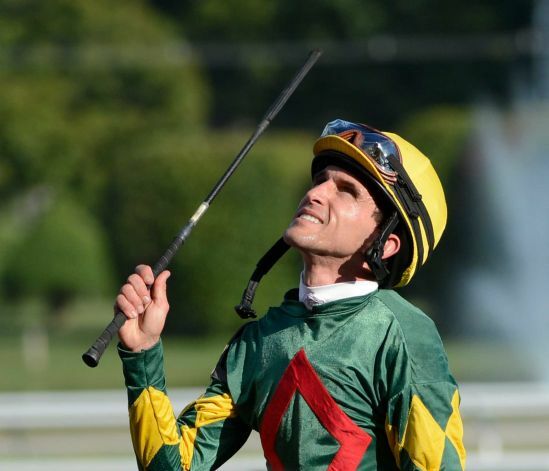 The record makes him the second jockey in Belmont Park’s history to have won six races on a single race card. Also, Ramon Dominguez has won five races in a day on several occasions at Aqueduct Race Track. His most recent record was made on February 17, 2010 when he won the first five races on the card. He was a recipient of the 2010 Eclipse Award for Outstanding Jockey.